Recently the latest edition of Chrome removed the Netscape Plugin API (NPAPI) architecture that Java requires to function. To enable the Java Applet based Lucid Player to work under Chrome, we have now updated it to support Java Web Start technology. What this means is if a key is accessed via Chrome, rather than loading directly inside the browser window, the Player will be launched as a separate application. All of the downloading of the Player and key data is handled automatically. The end user will not have to make any additional configuration changes for this to run. In order to deal with this Chrome problem for your users, we have updated the Lucid Builder with this newly updated Player. To update your existing Java Applet based keys download the latest Builder and redeploy your key. Fact Sheet Fusion v2.0.4.830 has now been released and is available to download from www.lucidcentral.org for registered users or to trial. This update includes enhancements to the Global Find and Replace feature that allows in place editing of the search results and a minor bug fix when importing older v1 fusion databases. Read more about this release or how Fact Sheet Fusion can speed up your key development click here. 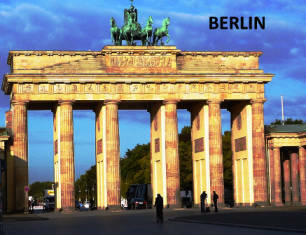 At the recent International Plant Protection Congress held in Berlin, August 2015, Geoff Norton presented a paper on behalf of the Identic team entitled “Digital technologies for diagnosis of insect pest, disease and weed problems”. This PowerPoint presentation, which can be viewed as a pdf file here (4MB), shows how digital technologies, such as Lucid keys and Lucid Mobile apps, are complementing alternative means of providing support to the identification and diagnosis of pest and crop problems: examples include smart phone apps for weed identification and for the diagnosis of crop problems in rice in SE Asia and field crops in Western Australia. Another speaker in the same session – Dr Terrence Walters – talked about the strategy of the Identification Technology Program of the USDA, which utilises a range of digital technologies, including Lucid and Lucid Mobile, to provide support to users in the USA, ranging from quarantine inspectors at various points of entry to those concerned with pest surveillance in the field. A brief description of the ITP program can be viewed further below. The Identification Technology Program (ITP) in the USA – developing digital identification and diagnostic tools for biosecurity and plant protection. The US Department of Agriculture (USDA) established the ITP almost 10 years ago. Its purpose - to develop digital identification aids and tools primarily for use by staff in the USDA Animal and Plant Inspection Service (APHIS). 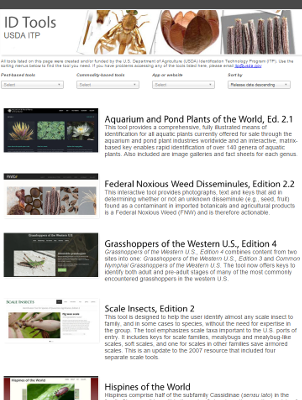 Since these tools are freely available on the web and as mobile apps (go to (www.idtools.org), they can be used by other individuals and agencies involved in biosecurity, plant protection, taxonomy, and education, both within and beyond the USA. Based in Fort Collins in Colorado, the ITP team responds to requests for improved diagnostic tools from various agencies within USDA; prepares proposals, seeks funding, contacts appropriate content experts, and provides overall management support for the development and deployment of the final product. Initially the focus was on the development of identification aids for taxa containing important pest groups and species, particularly insect pests and weeds posing threats to USA agriculture and natural resources. 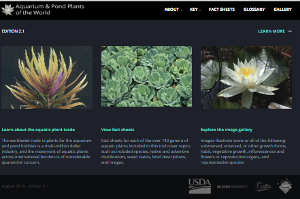 For instance, an identification key was developed for aquarium and pond plants of the world – including those species responsible for the worst aquatic weed problems. Another early key, recently updated, is Flat Mites of the World – a tool designed to help identify any flat mite to genus, and in some cases to species, without the need for expertise in the taxonomic group. A review of the ITP Lucid Mobile key to terrestrial molluscs has recently appeared on the US Government site – DIGITALGOV. More recently, diagnostic tools have been developed for plant disorders, such as those found in citrus and palms, using the same Lucid key system (www.lucidcentral.org). The following table shows the top 5 ITP Lucid based Internet tools being used internationally over 6 months from January to June 2015. 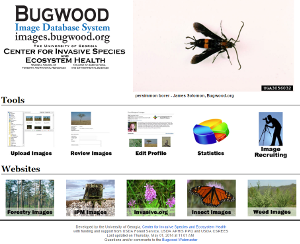 Good images are extremely important for confirming correct identification and diagnosis, and the ITP, in collaboration with the Bugwood team at The University of Georgia in the USA, has developed a node to an image database that enables users to filter images relevant to their specific crop and pest problems. The image database is also being linked to Lucid keys to provide integrated identification and diagnostic tools. 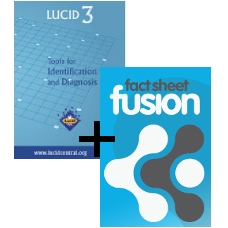 Purchase both Lucid and Fact Sheet Fusion together and receive a 20% discount! Click here to take advantage of the offer. For our overseas customers it's never been a better time to purchase Lucid and Fact Sheet Fusion with the current exchange rate!